Bats have been compared with spy planes. Both possess complicated mechanisms controlled by ultrafast computations. Research has shown that the sometimes odd-shaped bat heads have the precise shape needed to act as a sonar device, capable of accurately sending and receiving sound waves. 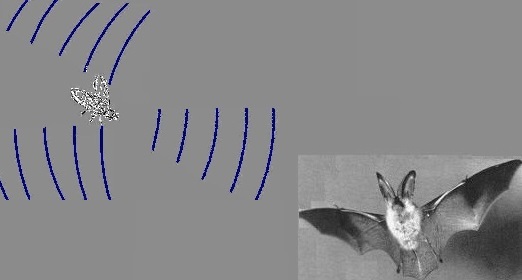 A bat determines how far away the object is by detecting the time delay between signal transmission and echo reception. Its whole sensory system weighs only a fraction of a gram, but it is millions of times more effective than any man-made radar or sonar. A bat can detect the emitted echo’s of his ultrasonic signals among thousands of others, even when his echoes are 1000 times weaker than the background noise. A fruit fly can be localised at a distance of 100m / 330 ft distance and the bat can catch four or five of them per second. The bat’s sound pulse rates range from as low as 10 times per minute during normal flight to up to 200 times per minute when an insect has been detected. The brain of a bat demonstrate capabilities of processing huge amounts of simultaneously arriving signals. In some bats, the ear muscles contract during the transmission of every sonar pulse to protect the ear against the very high sound level. These muscles then relax immediately afterwards to allow the ear to regain maximal sensitivity for the returning echo. Many bats produce move the frequency of the pitch an octave during the “shout”. This technique called chirp modulation is used in modern radar. Frequency changes present even more information in the received echo. There are “baby bat rooms” where hundreds of newly born bat babies all hang together from the ceiling. The mother bat can locate her own tiny hairless baby in order to breastfeed it with the help of the echo of the ultrasonic frequency she transmits. 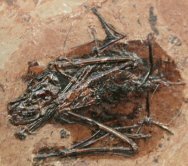 This image shows a fossil bat that was found in Germany. Research of the stomach contents shows that it ate insects. Body parts were found that indicate that these early bats already used sonar. A human person is a complex being, just like a bat. On top of that humans can think, are curious and can pose questions about how the bat was able to acquire such a complicated technology. Their skills were only mastered and applied by humans in the 20th century. People can interpret a phenomenon in completely different ways. Even when humans ponder their own origins their conclusions are derived from either the evolutionist or the creationist viewpoint. In almost all schools the evolutionist viewpoint is compulsory study material while the viewpoint of a factual Creator and a purposeful creation are ignored. History is purposely written depending on the location. On a world scale, we can see that in the way the same historical facts are approached by different nations. In the same way, the description of the history of the origin of man will differ. It all depends on the viewpoint the author had and for which purpose it was written. Science is based on the practical application of the laws of science, independent of the observer. The teaching of science and chemistry is tested by lab and field work. Students can prove the validity of the laws of nature. History is not like that. It cannot be verified in this way. We are dependent on words that have been passed on to us, either oral or written. If we want to place a validity on views of our origin, then we need to consider the viewpoint from which was written, and also what the purpose was. We also need to believe that the words are true. Neither creation nor evolution can be proven scientifically. Even if it would be possible to produce a human in a lab, this would still not prove that it happened that way in the past. Biblical history has a clear purpose that is stated in the Bible. When evolutionary history is taught, it would be appropriate to first explain what the purpose of the teaching actually is! The viewpoint of creation and the fall of man is based upon the Bible and also the human mind. If we study the bat, our understanding convinces us that such a complicated system could never develop by itself. The complex construction of the bat declares the presence of immense amounts of information. We must conclude that there must be a non-physical source of information. Think of the analogy: a spy plane can also not develop by itself without an intelligent source of information. Through faith we understand that the worlds were framed by the word of God, so that things which are seen were not made of things which do appear. (Hebrews 11:3). What is the evolutionary viewpoint based upon? Most people will define their viewpoint of the origin on what was presented to them in schools and the news media. However, assemblies of fossil bone remnants and definition of human extremities only show the view of the author. belief in what has been delivered to us in the Bible. You have the freedom to choose which viewpoint you will assume.